CraneWorks’ new Demag AC 45 City has a main boom length of 102.4 ft. (31.2 m) and a maximum system length of 145 ft. (44.2 m) to give it plenty of lifting height and reach whether operating outside or inside. Already popular in other parts of the world, the Demag AC 45 City crane has now made its way to North America. CraneWorks, a prominent crane distributor throughout the United States and Canada has recently taken delivery of the newly introduced Demag crane. With an overall length of just 28.6 ft. (8.69 m), a width of 8.4 ft. (2.55 m) and a height of 10.4 ft. (3.16 m), the Demag AC 45 City has the most compact dimensions in its class, and is well suited for working indoors, as well as in tight urban environments, according to the manufacturer. Even though CraneWorks' new Demag AC 45 City is compact, it is still up for handling challenging lifts with a maximum capacity of 50 tons (45 t). It also has a main boom length of 102.4 ft. (31.2 m) and a maximum system length of 145 ft. (44.2 m) to give it plenty of lifting height and reach whether operating outside or inside. According to Keith Ayers, CEO of CraneWorks, CraneWorks is committed to providing customers with the most innovative and productive lifting solutions, and the Demag AC 45 City is the best of its class. "We have a lot of customers who work in urban areas," he explained. "It can be a real challenge if they don't have the appropriately sized crane that can handle challenging lifts. This new unit is everything they want in a crane. It has a compact chassis that can fit where other machines can't, it has an incredible reach, and it can lift heavy loads with ease. I think our customers are really going to like this crane." 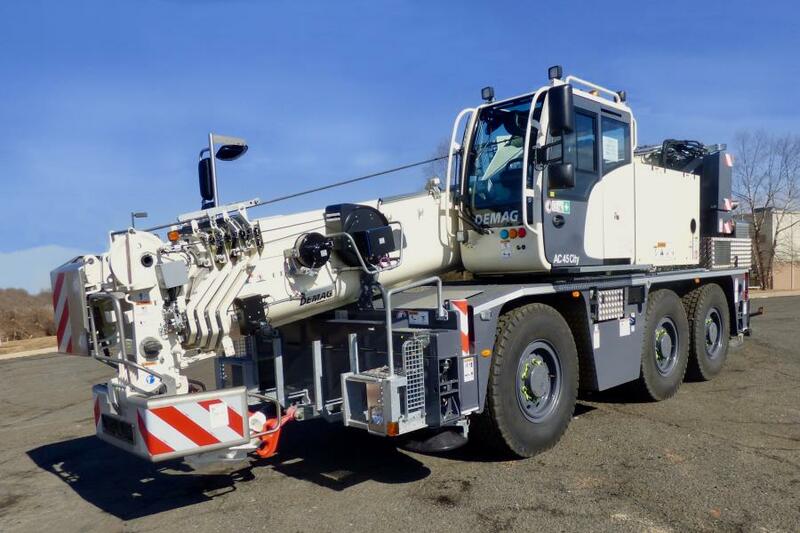 Like many of the other Demag all terrain cranes in CraneWorks inventory, the Demag AC 45 City is equipped with an IC-1 Plus control system that determines the crane's lifting capacity for every boom position in real time. This feature helps reduce the amount of counterweight needed for lifting heavy loads. For more information about, visit www.Terex.com.